Alkina Lodge boasts three architect designed four bedroom luxury lodges, available to be booked separately or together, ideal for group getaways or corporate retreats. Relax and enjoy the luxurious surrounds and additional indulgent services such as a personal chef to prepare a meal for a memorable getaway. Alkina is an Aboriginal Australian word, which literally means Moon. Set amongst native bushland, overlooking the Great Ocean Road, Alkina Lodge is just 20 minutes from the 12 Apostles and 3 hours from Melbourne. Luxuriously secluded from the world, Alkina features three architecturally designed, four-bedroom luxury lodges ideal for families, groups or corporate retreats. Each luxury lodge has four bedrooms and two bathrooms, sleeping up to 8 guests in style and comfort. The self-contained lodges feature gourmet kitchens with Gaggenau appliances and Nespresso coffee machine. 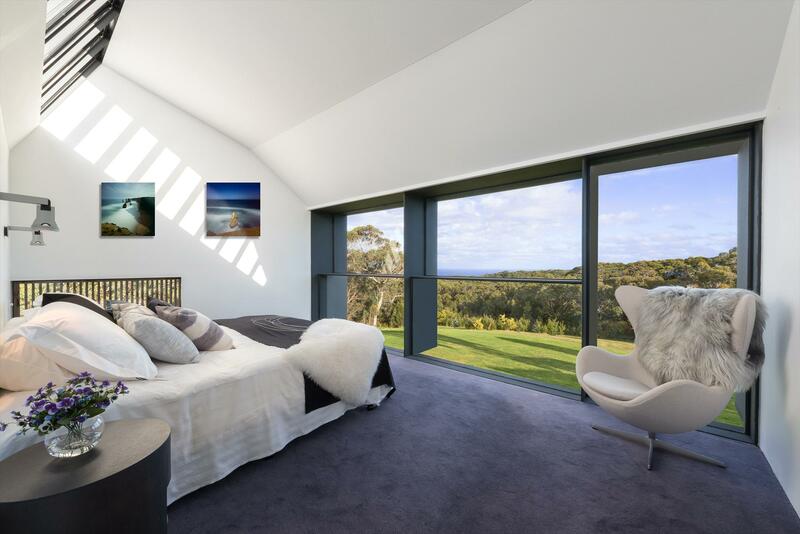 This spacious Great Ocean Road holiday house features magnificent art and photography, fine European furniture and Bose entertainment system. Built for entertaining, return from a day exploring the Otway Harvest Trail with fresh, local produce and cook up a storm. Dine alfresco in the outdoor entertaining area, complete with BBQ facilities or arrange for Alkina's inhouse chef to prepare a special 3-course dinner for special occasions or events. Personal chef services by prior arrangement and additional costs apply. Alkina Lodge has been designed by award winning architects Glenn Murcutt and Wendy Lewin incorporating eco principles and complimenting the surrounding natural environment while not sacrificing style. Heating is passively solar, supplemented by gas-fired hydronics for the underfloor heating in the bathrooms and bespoke fireplace. There is no air-conditioning, with the lodges cooled by the southern ocean breeze and supplemented by Dyson bladeless fans. Alkina Lodge rates are based on two guests, simply add the additional number of guests to view the rates for up to eight guests per lodge. All four bedrooms come with king beds that can be converted into 2 x king singles. When you book accommodation at Alkina Lodge, regardless of whether you are a party of two or eight, you will have the entire lodge to yourself. Alkina Lodge is the closest luxury accommodation to the 12 Apostles and is a great base to explore everything the Great Ocean Road region has to offer. Take the M1 towards Geelong and then the Geelong ring-road to Colac. Once in Colac, follow the signs to Lavers Hill and the Great Ocean Road. Continue through Lavers Hill to Wattle Hill (approximately 15 minutes), turning off the road at Moonlight Head Road. Turn left at Parkers Access Track. The entrance drive is located at number 35. For the scenic route, take the Geelong ring-road and follow the signs to the Great Ocean Road. Drive along the coast through Lorne and Apollo Bay. Follow the directions above from Lavers Hill. Take the Princes Highway, east through Murray Bridge to Warrambool. Continue along the Great Ocean Road to Port Campbell and the Twelve Apostles. Turn right at Moonlight Head Road (approximately 30 minutes after Port Campbell). Turn left at Parkers Access Track. The entrance drive is located at number 35. As a small boutique property our business depends on maximising occupancy. Cancellations often result in empty rooms due to booking lead times. For cancellations within 2 months of arrival date 50% of the total will be refunded. For cancellations made within a month of arrival all monies will be forfeited. No refund can be given in the event of non-arrival. We recommend that you protect yourself with travel insurance. Designed to create an exclusive and intimate experience, Alkina Lodge offers the discerning traveller private luxury accommodation on the Great Ocean Road. Each of the four bedroom luxury lodges can accommodate up to 8 people, on a double-occupancy basis. Each room has the choice of having a king bed or 2 singles. Meal hampers are available at additional cost and require a minimum of 7 days notice.